The Dump Pouch from Voodoo Tactical does exactly what the name suggests--provide a convenient and portable space to dump spare magazines, loose rounds and miscellaneous items. A drawstring extended collar keeps contents secure while allowing a wide-opening for easy rummaging through contents. 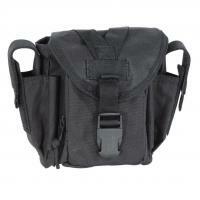 The flap cover secures with a quick-release buckle for instant access to the main compartment. The pouch carries two side-mounted pistol magazines. These mags are retained with the adjustable flap covers that flexibly adapt to varied magazine sizes. The pouch incorporates a pair of pen slots on the front for ready use when taking notes for data sheets. Voodoo's universal straps allow for attachment to a range of webbed platforms offering incredible versatility and convenient carry.